Explanation: This remarkable picture of a slender crescent Venus was made during daylight hours on March 26. Venus was then very near inferior conjunction, its closest approach to a point on a line directly between Earth and the Sun. 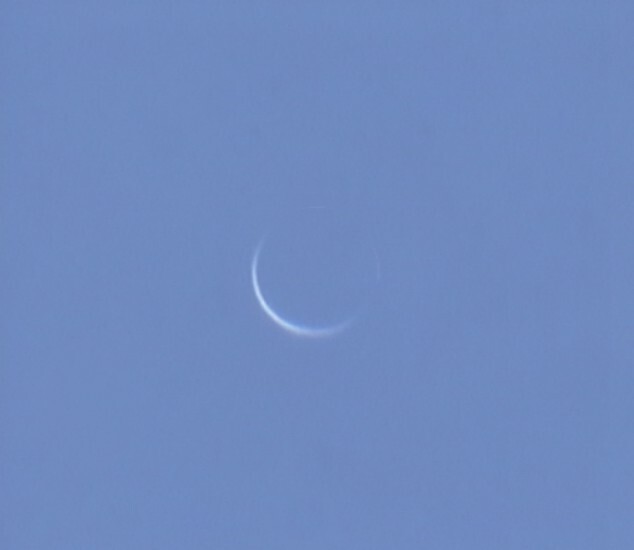 So, daylight was a good time to carefully record the telescopic view when both Venus and Sun were high in the daytime sky. Near inferior conjunction, Venus is closest to us and at its largest apparent size, but Venus is also strongly backlit by sunlight, presenting its night side partially outlined by a narrow crescent. What makes the image remarkable are the faint arcs extending beyond the sunlit crescent around to the night side of Venus, due to sunlight filtering through the planet's dense atmosphere. Astronomer Eddie Guscott reports from his site in Essex, England that the faint extensions came and went as the Earth's atmospheric blurring changed. His image was constructed from 85 of the sharpest frames chosen from thousands taken with a webcam and telescope.